This is one of my all-time favorite shots. First of all, I just love the magic and whimsy of a tutu. 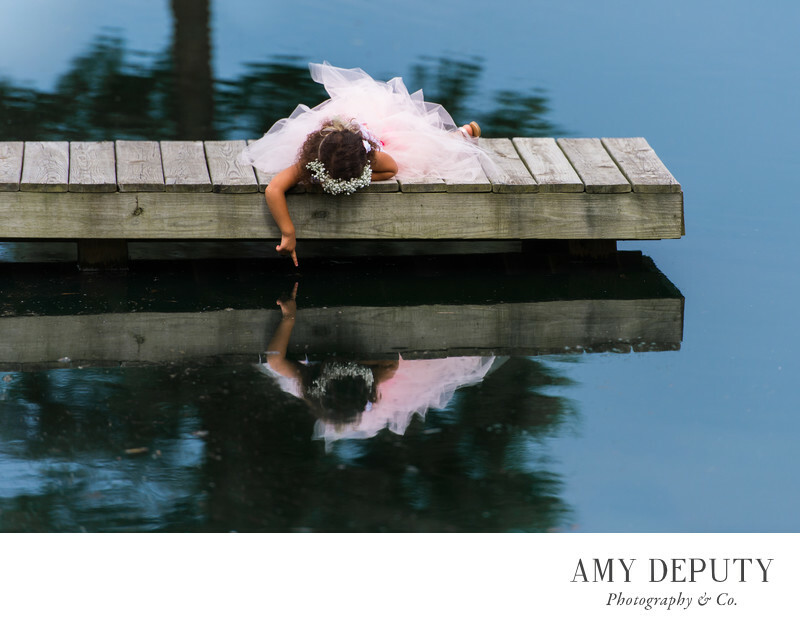 Then there is the curious young girl, reaching out to touch the blue water and in it, her reflection. She is discovering nature and herself within it. The scene is enchanting and serene. Pond View Farm offers up many such settings for photographic moments like this, with its tranquil pond set within the lushly green and rural landscape of northern Harford County, Maryland. Some of my favorite places to photograph couples before, during and after they take their vows are: outside the large stone house and its two story porch or the painted red wood and stone barn, on the dock beside the pond, and underneath the cascading branches of the weeping willow tree. This working farm is truly perfect for a rustic farm wedding. Location: Pond View Farm: 2601 Jolly Acres Rd, White Hall, MD 21161.